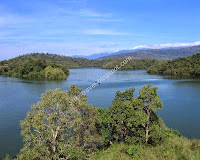 It is a popular picnic spot in Kerala around 35 Km from Trivandrum. We hired a tourist vehicle and reached there by noon. As we approached the dam, the surrounding views were mesmerizing. It is surrounded by the river, park and hills which makes it picturesque. We spent some time taking pictures and proceeded to Crocodile farm which is about 0.5 to 1 Km from the dam. On the way to farm, we saw a snake entering into the house and we alerted the persons inside the house. But they were cool and said it is regular visitor..
Safari Park is located on the other side of the river and can reach by ferryboat. We skipped Safari Park due to time constraint and proceeded to Trivandrum zoo. The zoological park is interesting place to visit which is approximately 3 Km. from the heart of the city. The zoo is surrounded by evergreen and dense forest. There are varieties of animals like Lion, Tailed Macaque, Capuchin Monkey, Himalayan Black Bear, Elephant and birds like Grey Heron, Spoon Bill, Rosy Pelican, Peacock, Blacknecked Stork etc. It took nearly 2 hours to troll the zoo. After zoological park, we visited Chitra Art Gallery which is nearer to it. We saw vast collections of Raja Ravi Varma and his niece Ravivarma’s splendid paintings. All paintings look as if they really speak to us (சித்திரம் பேசுதடி, Chithiram pesuthadi). Apart from Ravivarma’s paintings, Tanjore painting, Mural painting, Chinese Painting etc; are displayed. It is the paradise for art lovers. It is one of the oldest museums in Trivandrum located near zoo. Here we can find rare collection of antiques and different ancient musical instruments. All enjoyed the video of celestial bodies inside planetarium. Later we visited 3D show but it was not as expected and we were upset :(. Models of rockets and aero planes are exhibited outside the planetarium. We took few snaps in front of these exhibits and proceeded to Temple. This Temple is situated at Sri Varaham, East Fort. The main Deity is Varaha where Goddess Lakshmi is seated beside him. This is a rare temple and one should not miss this. This is one of the important temples in Trivandrum, where one can see the breaking of coconut continuously by the Devotees thereby making their wishes come true without any obstacles.